At SurgeonMasters, we are driven by a passion for performance improvement and a strong desire to deliver excellent patient care. To do so, it is critical we care for ourselves with healthy and sustainable practices that promote well-being and prevent burnout. The 8 PRACTICEs is a methodology designed to bring awareness, intention and purpose to your actions. Reflect: Raise awareness and analyze your practices. Set Goals: Develop a strategy to improve your performance, break a habit or incorporate a new one. Intentionally Adjust: Incorporate changes. Repeat the cycle for continued learning and development. A copy of your responses will be emailed to you for performance improvement tracking. SurgeonMasters will follow-up with suggestions to promote your success. On a scale of 1-10 with 10 being the highest level, how passionate are you about creating this change? What are your most important roles and relationships? How might the give and take of these roles and relationships impact your ability to implement this change? How might you decrease negative attitudes or increase positive attitudes to implement this change? How might communication be improved to create mutual understanding related to this change? If time / life management is more related to being in a great rhythm (quality time more than quantity and focus on the issue,) how could you improve quality time and focus related to this change? What are the shared goals of other stakeholders, and how could you address these to inspire this change? No matter how complex or simple this change appears, how could you further simplify the steps to create this improvement? Whether physical, mental, emotional, or spiritual energy, how might you increase the energy needed to achieve and sustain this improvement? Thank you for using the The 8 PRACTICEs Performance Improvement Tool. Your responses will be sent to you. 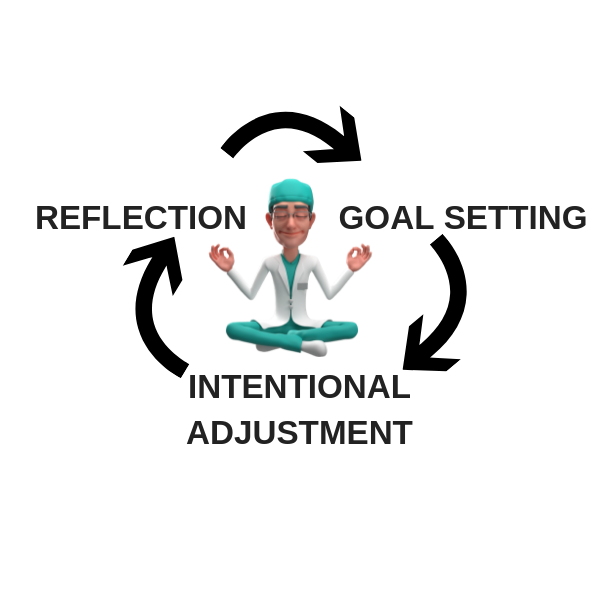 A methodology that drives performance improvement in everything surgeons do.